Baseball’s a little easier and I’ve gotten some good exercise running the makeshift bases we set up in the backyard. I can slug one pretty good, too. But basketball’s where I really shine. 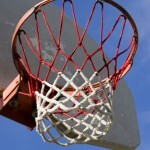 Our kid-sized hoop can be set at 4, 5 or 6 feet height. Perfect for a six year old and… Mom. My skills are now perfectly matched with Son’s. Since Son loves to play, he plays all the time. And basketball’s a game that can be played solo. So he’ll run outside before school, after school, after dinner, anytime – to shoot hoops. Our nine year old neighbor loves to play the game, too. So they play a lot. And what happens when you practice something? You get good. I’m watching the whole Outliers principle in action: You like to do something, you do it a lot, you get good at it. There’s also the whole genes angle. Your Dad talks about and plays a sport a lot. Your Uncle coaches it. You want to do it, too. It also helps if you grow real tall. As it turns out, basketball’s good for academics, too. Teacher mentioned in the early spring report card that Son couldn’t count by 2’s yet. When we were shooting hoops a few days a later, I asked him to keep score. Two points for every shot. Perfect. He struggled in the beginning but at our conference last week, she said he had nailed it. Good sportsmanship is another matter. At five, he had to win everything. In fact, he dictated the rules and I just played along trying not to injure myself and coach him gently about being a good winner and loser. No dice. He was pretty sore every time I won. But now that he plays team Tee Ball and soccer and looks up to his nine year old neighbor, both his physical and social skills have improved on the field and court. My skills are coming along, too. I may still prefer a hike with the dog for exercise, but I cherish our time in the driveway dribbling, blocking, throwing and…scoring two points.